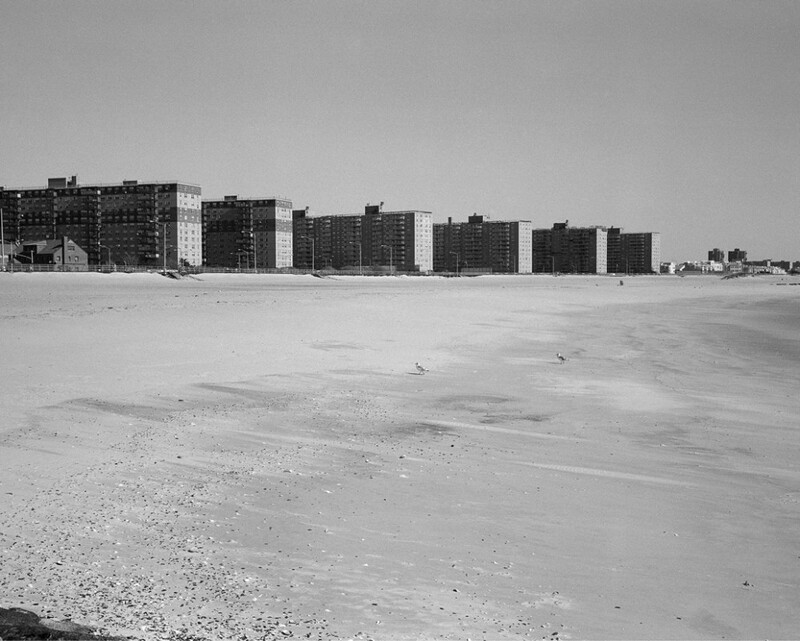 Rockaway, the beach that Robert Moses built, pre-Sandy. The man who built most of New York City’s highways never learned to drive a car. Robert Moses left his office at the end of each day in a chauffeur-driven limousine; a second limo would follow in his wake so that Moses could dash off memos and to-do lists for a secretary to bring back to the main office. And, just in case he needed to let off a bit of steam, a taxpayer-funded boat and its captain were kept on 24-hour standby, ready to take Moses out for a jaunt around the Great South Bay. Moses reigned as arguably the most powerful figure in New York City politics from 1934 until his fall from power in 1968. Today, almost every part of the city bears some evidence of his massive public works projects: parks, highways and bridges (the BQE, the Verrazano, the RFK) and housing projects. 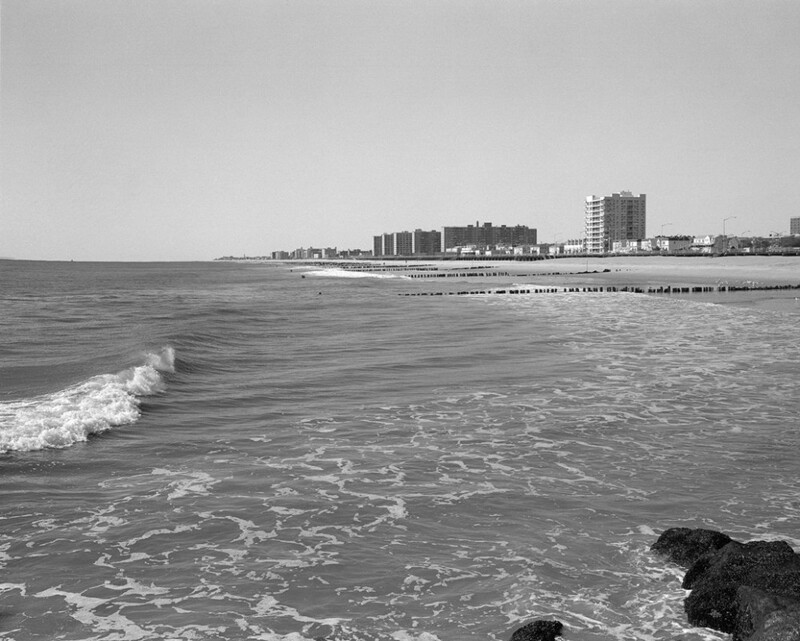 Few areas, though, were as radically reshaped by Moses as the Rockaways. 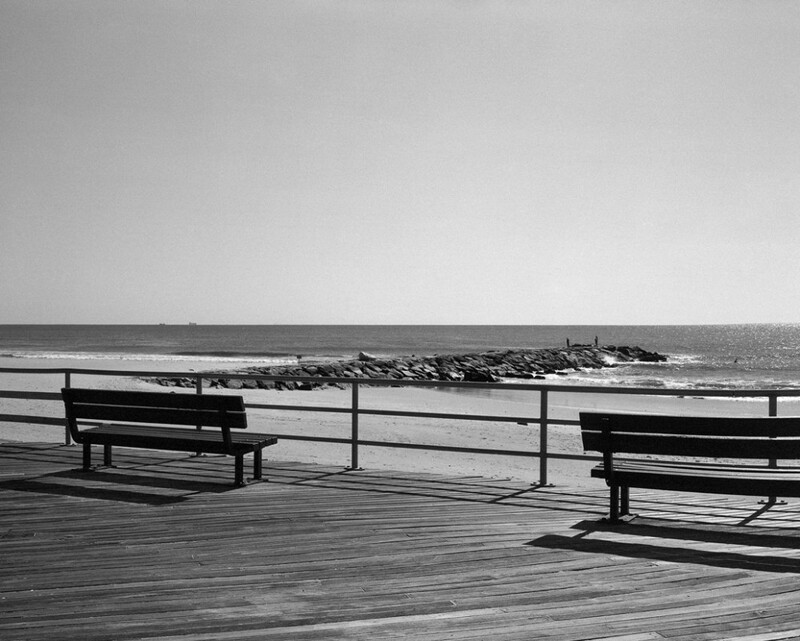 He loved the ocean, and he believed that the peninsula — far less overbuilt than Coney Island — had the potential to support a year-round population as well as a recreation facility to served the whole city. As a result, almost everything you might associate with a surf session in Rockaway is a result of Robert Moses. The A train over Jamaica Bay. The drive over Cross Bay Bridge. The dash across the Shore Front Parkway, the “highway to nowhere.” The tower blocks. The bunkers housing the boardwalk concessions. Even the stone jetties. 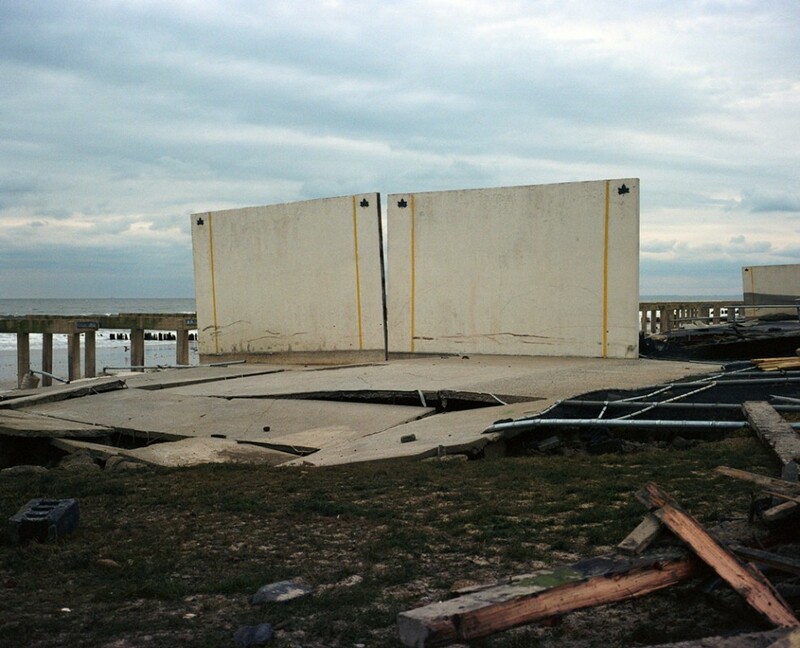 These structures are the basic elements of the Rockaway surf experience, and they are Moses’ work. 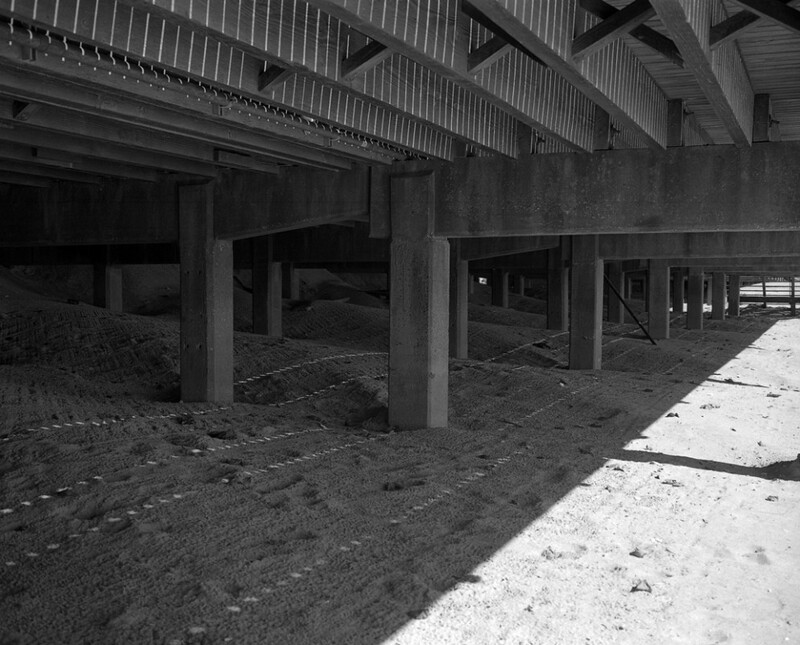 Under the boardwalk at the Rockaways, pre-Sandy. During last summer’s doldrums, when I tired of trying to paddle into six-inch ripples that dumped me onto the sand next to wading toddlers, I plowed through Robert Caro’s legendary 1246-page biography of Moses, The Power Broker. Picking up that book might have been the only exercise I got most days. It paints a starkly negative portrait of Moses, emphasizing his Machiavellian tactics, his racist beliefs, his emphasis on the automobile rather than mass transit. After finishing the book, feeling like a freshly-minted Moses expert, I ran into Queens Museum Director Tom Finkelpearl at a party at Rippers on the Rockaway Beach boardwalk. I was sipping a piña colada, doing my best to be an embodiment of Rockaway surf mellow. Tom — a part-time, non-surfing Rockaway resident — told me that he considers Moses’ impact on New York to have been more positive than negative, by a slender margin. He had a lot to say on the topic — a lot. Finkelpearl’s got a stake in Robert Moses’ legacy; he helms a Moses-built museum in the middle of a Moses-created park, Flushing Meadows. In 2007, the Queens Museum hosted part of a major exhibition that aimed to re-appraise Moses’ legacy. The exhibition organizers felt that his works should be reconsidered in light of the long-term success of New York as an urban model. Today, the Big Apple stands in marked contrast with so many cities that have no functioning public transportation, no vital urban center, or a declining population. I started to wonder: if we give Moses some credit for the success of New York City, should we also pin him with some of the blame for Rockaway’s failures? Here’s what I could figure out: basically, it’s complicated. Alright, it’s not like you surf in the bay, unless you’re one of those kite people. Still, you probably would feel less happy about sitting in the ocean water for a six-hour session if only a thin strip of sand separated you from a festering stew of industrial slurry and human feces. Which is what Jamaica Bay was and would have continued to be. According to Finkelpearl, “If you look at Jamaica Bay, there’s just no question that that’s one of Moses’ greatest triumphs from any perspective… This is the largest nature preserve that’s within a city in America.” Before Moses, Jamaica Bay was a disgusting mess of raw sewage. And it wasn’t getting better: in 1938, says Finkelpearl, “There was a proposal to put a huge incinerator on an island in the middle of the Bay.” Moses killed this idea and fought for the establishment of sewage treatment plants, including one in Rockaway. He tore down homes that had been constructed on the Bay’s islands. To attract migratory birds to the area, he built two dikes to create artificial fresh-water ponds, hiding the cost in his budget for the reconstruction of the trestle bridge. More than 325 species have been recorded in the area in the last twenty-five years. Don’t get the wrong idea here. 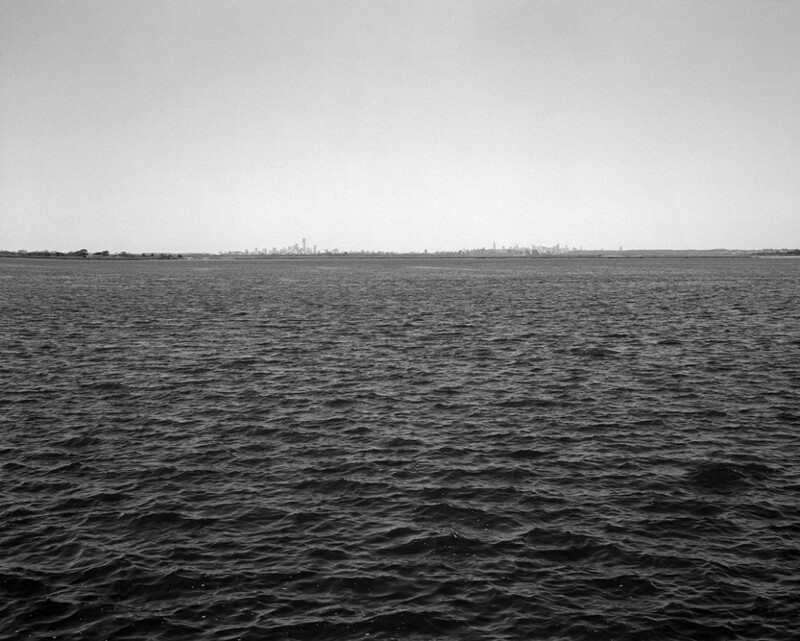 Even when it came to Jamaica Bay, Moses’ record as an environmentalist was less than pristine. To reclaim usable parkland, he filled in wetlands with raw sewage and city garbage. It’s probably a good thing that his vision for construction around the Bay — which included additional swimming beaches, a marina, and tennis courts — was only partly completed. The A train en route to Rockaway. Before 1950, you could travel from Penn Station to Rockaway Beach in thirty minutes on the LIRR. Today, the same trip takes an hour and a quarter, minimum — but it’ll only cost you $2.25, definitely the best deal in town. In 1950, the bridge that carried LIRR trains across the Bay burned down. 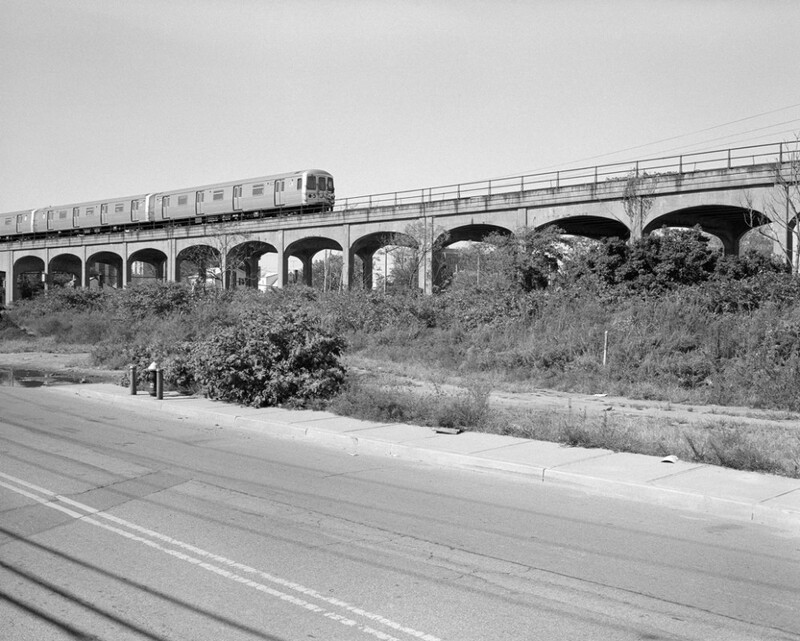 The Rockaway line had long been losing money, and the railroad as a whole faced hard times. While Moses poured public money into building modern highways up and down Long Island, the LIRR was well on its way to becoming, according to Caro, “the worst railroad of any kind in the entire country.” By the time Moses left power, the LIRR was squalid, and it was never on time; Caro notes that “the 7:45 AM from Babylon to Brooklyn, did not appear for 102 consecutive days.” When the trestle bridge burned, the city felt it had to act. Rockaway’s summer business plummeted, and the city appointed a commission to investigate the situation. The commission’s chair? Robert Moses. In the case of Rockaway, Moses came down on the side of the subway: it was at his recommendation that the city purchased the railroad and rebuilt the trestle. However, here the historical record gets foggy: after Moses wrote his report, a decision was made to re-route the tracks. Instead of running through solidly middle class neighborhoods in Queens, the subway took a more roundabout route through Brooklyn and — gasp — Bedford-Stuyvesant. Today, the old Rockaway rail link along Woodhaven Boulevard is an elevated forest of weeds. The peninsula’s politicians still dream of resurrecting it, while its immediate neighbors want to create some sort of greenway bike trail. So your A train surf sessions can be chalked up in the Moses column, but you might have had an easier commute back in 1918. One of the houses which were chopped in half to accommodate Shore Front Parkway. Moses is, of course, better known for his highways than his railroads. He dreamed of building a great ribbon of asphalt that would run along Long Island’s barrier beaches all the way from Queens to Montauk. This would remain — like his Mid-Manhattan Expressway and his bridge across Long Island Sound — a grand, unrealized vision. But Moses did manage to build sections of this highway, and one of its remnants is well-known to Rockaway surfers: the Shore Front Parkway. The “junk and trash” that was torn out to make way for Moses’ parkway included tent colonies and bungalows used by working- and middle-class summer vacationers, hotels, an amusement park. Ad hoc constructions crowded right up onto the beach. However ad hoc they may have been, though, this area was used by many and offered an important source of local revenue. Its destruction is still remembered with bitterness. 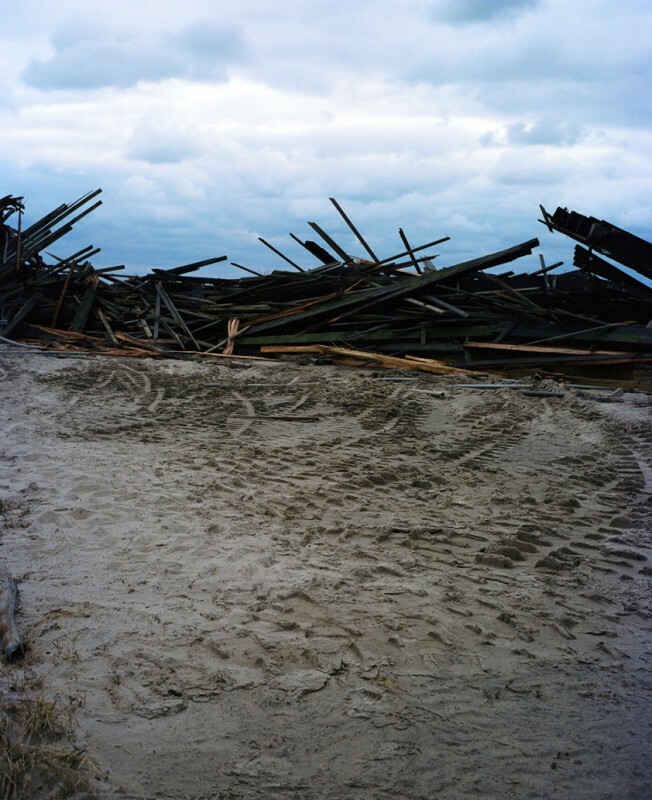 Earlier this spring, Moses was referred to in The Wave as the “Rockaway Villain;” some of the houses along Shore Front Parkway still bear the scars of Moses’ demolition. If part of the house extended into the city’s right-of-way, Moses would simply chop it in half. Shore Front Parkway with one of the houses in the background. Finkelpearl offers some defense of Moses’ actions. “He was interested in the de-commercialization of public space. That’s very, very different from the large-scale developments that are happening now.” Moses was an emphatic defender of the public ownership of beachfront. When local businesses advocated the construction of private hotels and cabanas in one section of the beach, Moses wrote, “Please draft a very emphatic letter putting this jackass out of his misery.” The beach was for all, not for hotels and honky-tonk amusements. “That section of Rockaway” includes the Beach 90th street break where I surf and, sometimes, live. Surfing there is an experience of aesthetic dissonance. On the one hand, waves, salt sea air, perhaps a pod of dolphins. On the other, hulking, unlovely architecture. Remarkably, the towers between 74th Street and 90th Street in Rockaway were not Moses’ idea. Apart from his craven negotiations with Gold Coast robber barons over the Northern State Parkway, Moses was notorious for refusing to brook any compromise with communities affected by his schemes, no matter how reasonable their demands. The Title I Housing near Beach 90th is a rare example of compromise in a long career of rigid, unbending will. It was a compromise that had tragic consequences for the local community. Moses’ original plan was to build a complex further west on the peninsula, between 102nd and 108th Street, in a largely white area called Seaside. When this idea was floated, the Rockaway Chamber of Commerce responded to the prospect of new housing with great enthusiasm, but they suggested one small revision to Moses’ proposal: they wanted the housing to be built further east, in the predominantly black neighborhood of Hammels. With controversy beginning to emerge around his other housing projects, Moses bowed to community pressure — sort of. He would build the housing in Seaside, as planned. But he would also build housing in Hammels. To give you an idea of the impact of this decision, there were 169 families who had to be relocated to make way for the Seaside development. And for the Hammels scheme? Likely well over 1,000. The Rockaway Chamber of Commerce saw the Title I project not only as an opportunity to land lucrative construction contracts, but also as a way to clear minorities out of the area. “If you consider Moses’ racist policies — which he was — the Rockaway Chamber of Commerce was more racist,” Finkelpearl argues. 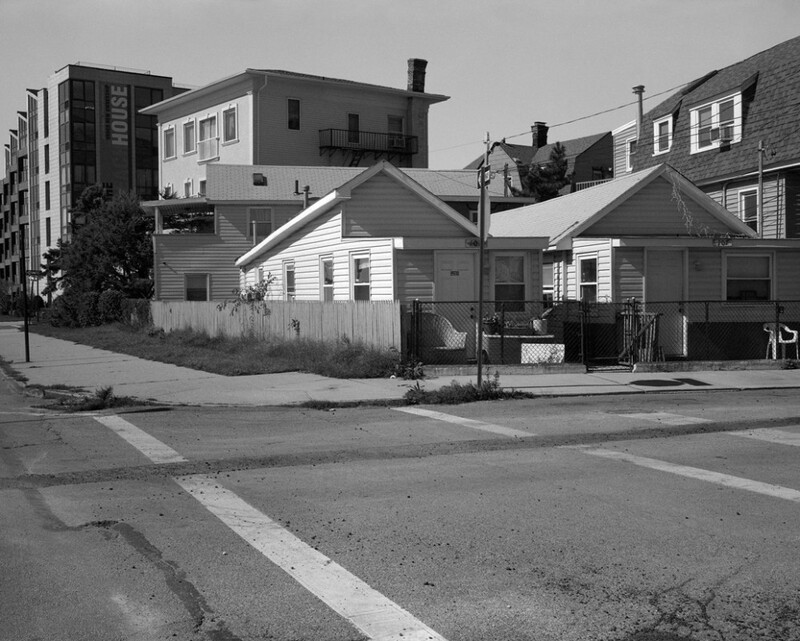 “The community representatives wanted to only put those Title I houses in an area that would have expelled black people.” They assumed that the development would force the Hammels residents to other parts of the city. But this is not what happened. Housing projects as seen from the beach. Though his racism is well documented, Moses did not share the goal of expelling minorities from Rockaway. At this point, he had cleared many neighborhoods in New York to make way for developments and highways, rarely with any regard for the local residents. 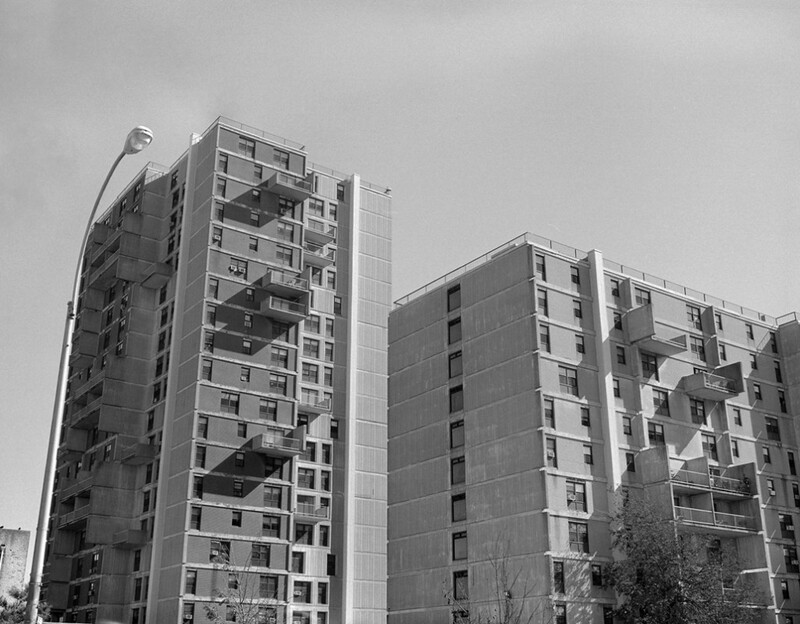 Those displaced by Moses projects like Lincoln Center or the BQE were mostly left to fend for themselves; a good number of them probably ended up living in Rockaway’s growing slums. But there is evidence that Moses wanted things to be different this time. He wanted to provide adequate housing for the displaced residents of Hammels within Rockaway. But this is not what happened either. What happened was this. Moses stepped down as Commissioner of Housing before the relocations took place. The Hammels residents were ousted, and — following the same pattern that unfolded in all of the city’s developments — only a tiny fraction of them were given a spot in public housing. 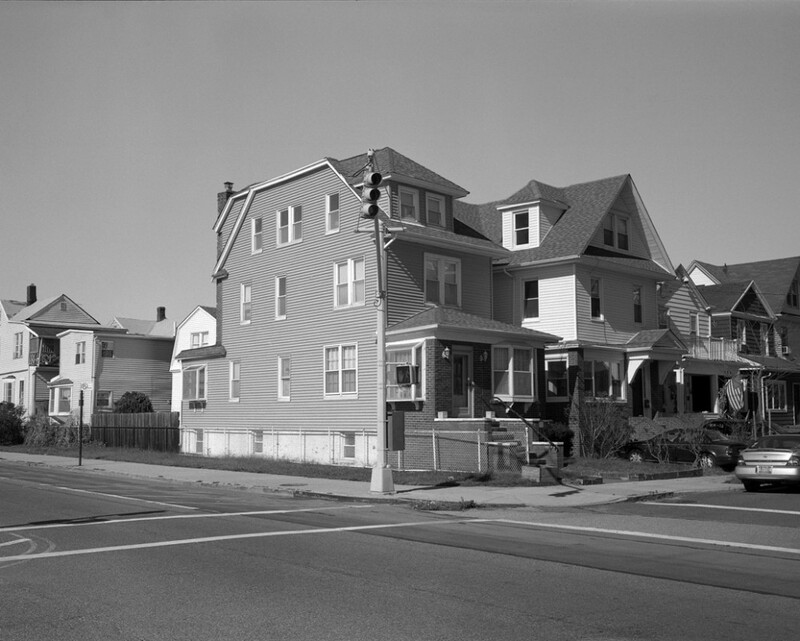 Rather than leaving the peninsula, uncounted numbers crowded into the adjacent slums of Arverne, piling into flimsy summer bungalows and boarding houses where tuberculosis ran rampant. There’s a bitter irony to all of this. A project initiated out of a racist desire to push out Rockaway’s minority population led to the creation of the worst slum in the city. With poverty, crime and disease spiraling out of control, the city began to see Rockaway as Siberia, as the place to which all problem cases could be quietly dispatched. Moses may have shaped Rockaway in concrete and stone, but other, less visible forces shaped it in more profoundly damaging ways. A stone jetty juts into the beach, pre-Sandy. One of the forces acting on the peninsula is, of course, the ocean itself. The word “Rockaway” is likely derived from an Algonquin word meaning “sand place.” For centuries, its shape changed constantly as a result of littoral drift; sand built up in some places and disappeared in others. 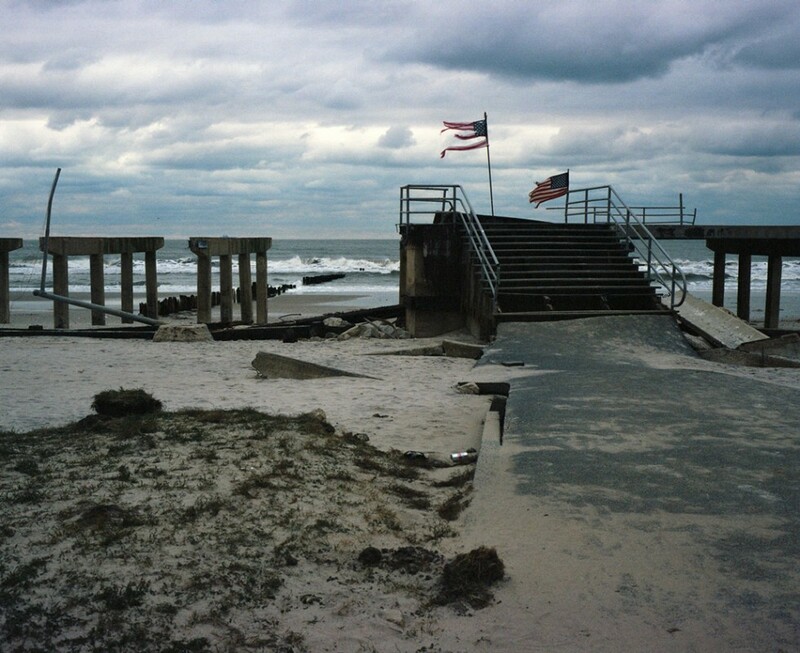 Breezy Point, for example, was underwater until the 19th century. Ironically, the ad hoc constructions and tent cities that once lined the Rockaway boardwalk were perhaps better suited to a constantly changing land mass. If they got washed away, they could simply be rebuilt. But Moses’ public works — beaches included — were intended to be permanent. Moses’ Parks Department in 1958. The drawing depicts the exact delineations of all of the proposed and existing beaches in New York City, Rockaway Beach included. The low-tide mark is a thick black line, as if the beach is a rigid structure with its borders fixed for all time. 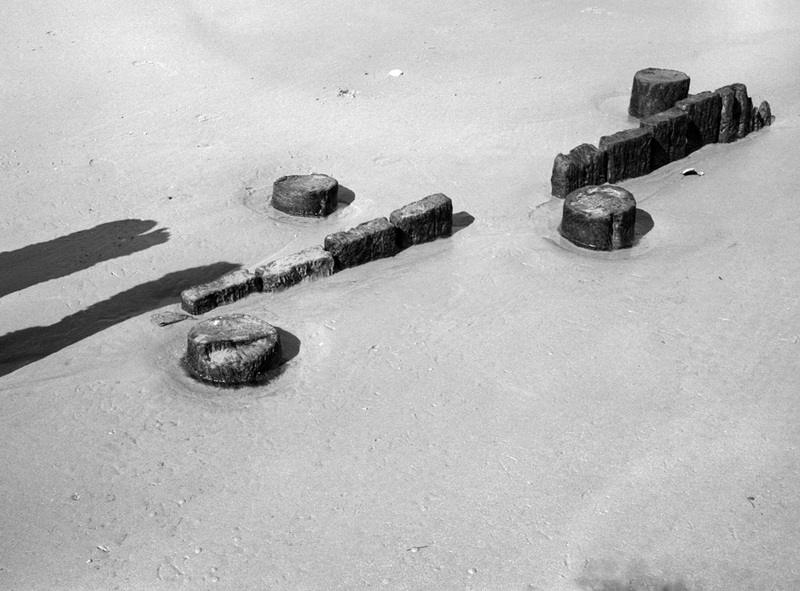 In reality, Moses knew that maintaining these shapes was a matter of constant investment; in 1957 alone, he allocated funds for the construction of more than forty stone jetties in the Rockaways. After his fall from power, whole sections of the beach would be washed out and closed to the public for years. For surfers, Moses’ stone jetties are the most complicated part of his legacy. A jetty doesn’t really stop erosion, it merely re-directs it from one place to another. This is why the beach west of the 90th street jetty is always eroded, while the Box to the east is always collecting sand. The jetties are a stopgap solution, and they cause accidents, but it’s hard to imagine the wave without them. 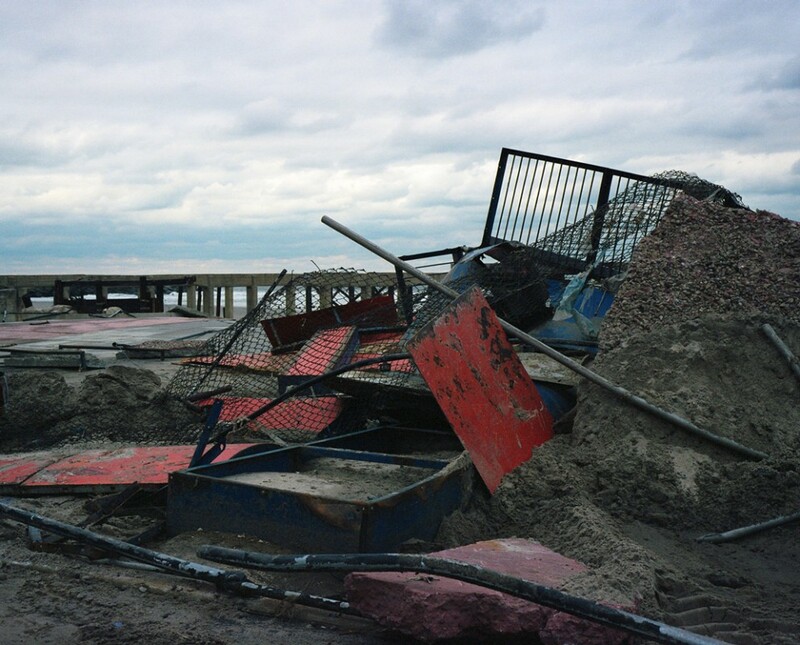 As with all Moses’ projects, the impact on Rockaway is mixed. Part of the fascination with Moses is that he held power at a time in which massive, transformational projects were possible — a time, in other words, unlike our own. His mistakes are carved in stone, and it’s easy to feel that they are impossible to change. But this would be missing the point. 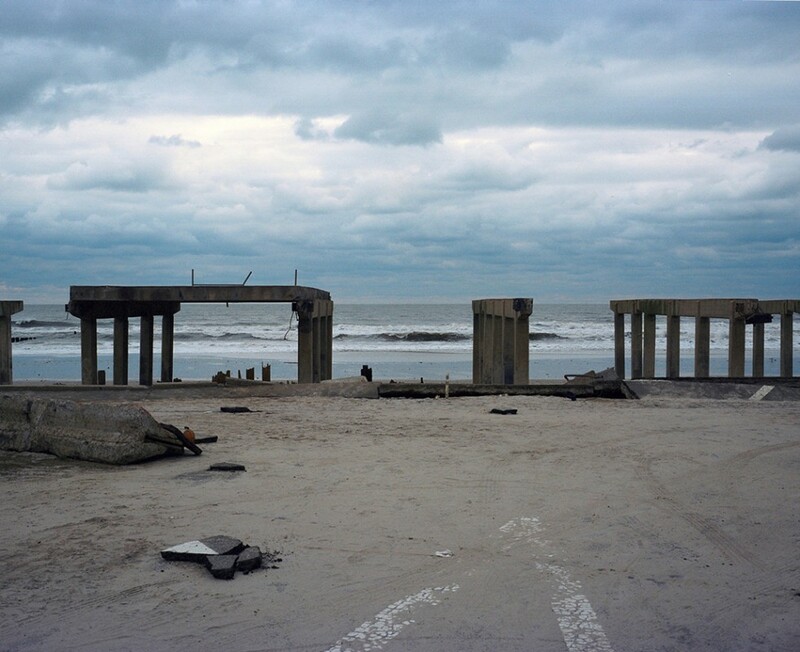 Moses may have poured a lot of concrete in Rockaway, but it is still ‘the sand place.’ As much as his physical structures — the rebuilt trestle bridge, the housing towers, the roads, the jetties — have shaped Rockaway, the fluid, dynamic forces, from ocean waters to racism, have had equally profound effects. 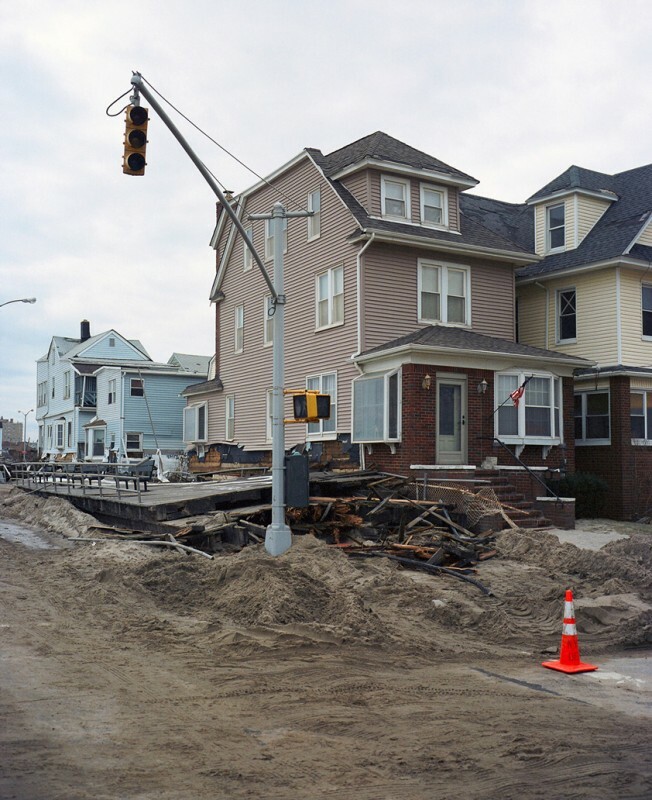 A note on the text: Super Storm Sandy hit just one week before this story went to print, and less than a week after these photos were taken, causing wide scale damage to much of Rockaway. 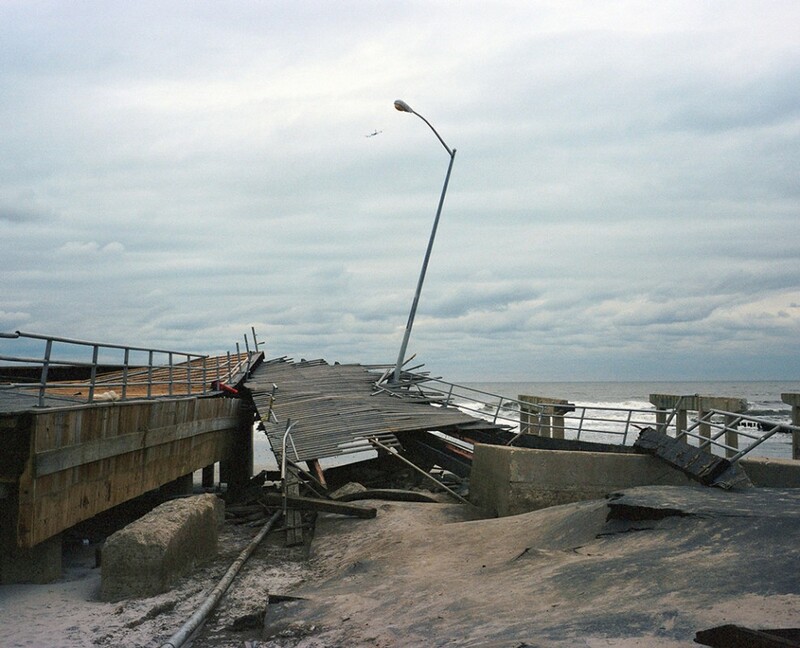 About the devastation, the author wrote: Hard times lie ahead, and winter is on its way, but I can’t shake the feeling that things could have been much worse for Rockaway. It is a densely populated area and few people evacuated their homes; the toll could have been far greater. One reason for this relatively narrow escape may prove to be the massive wetlands of Moses’ Jamaica Bay, which acted like a giant sponge and bore some of the brunt of the storm surge. If this is this case, it will cast new light on the Port Authority’s talks to expand JFK Airport into the Bay. Those wetlands likely saved lives and should be preserved at all costs. These photos were taken just 36 hours after the storm. A version of this story appeared in WAX Issue 2.